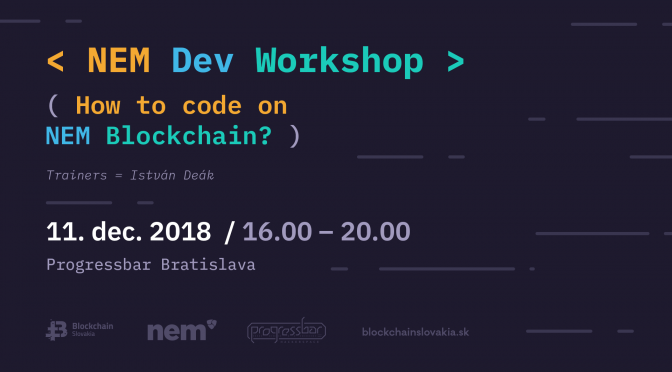 Blockchain Slovakia in cooperation with NEM.io Foundation organize the first NEM Developer Workshop in Bratislava. The trainer is István Deák, a Solutions Architect at NEM.io Foundation. Matúš Rajský, NEM Project co-ordinator for Blockchain Slovakia will accompany you at the workshop. Please bring your own device and prepare for the event. In case you sign up but can’t attend, please notify the group, as the Workshop is limited to 10 developers. To attend, you need to secure an Eventbrite ticket. The ability to implement & debug programs. highly recommended: http://blockchain.craftain.com/courses/getting-started-with-nem-catapult – It is for free and only a simple email registration necessary to access. Do not hesitate and register now, because at this workshop is only 10 tickets!